Wednesday | August 2, 2017	Stride along on a food trail with Bakerzin this August as we unveil “A Food Extravaganza Menu” exclusively at Gardens by the Bay Bistro. A diverse and distinct spread of food caters for all, from Burgers to Pasta and Asian delights, of which all are handcrafted specially with respect to global flavours. Indulge in a gastronomic delight with two fancy American burgers, the Shroom Burg packed with goodness of mushroom patty and pickles, and the Black Pearl containing the Signature Coffee Pulled Pork, what are you waiting for? 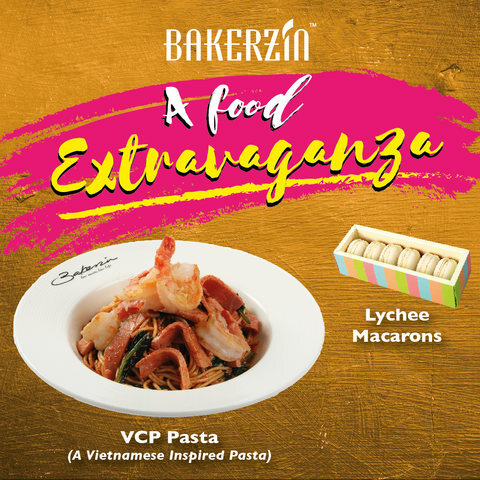 If that’s not enough, pick an adventurous dish of VCP Pasta, a Vietnamese inspired pasta, tossed in cream, sriracha sauce and spices, this is our best pick for the month! Other items in the menu include, Pork Chop (450g bone-in) with Apple Mash and Brussels Sprouts, the Japanese inspired Mentaiko Pasta with Smoked Salmon, and pick from two interesting appetizers, a Masterchef inspired creation of sweetened pork and watermelon cubes or ham and vegetable quesadilla. Finish off your meal with a cooling Garden Tea Punch! A Food Extravaganza will be available exclusively at Gardens by the Bay for a limited period! Hurry down today!